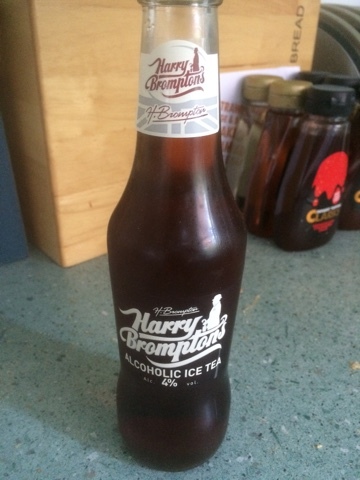 I received a present from my boss a while back of this alcoholic iced tea, and as I don't tend to drink alcohol at home I figured I'd save it for a nice hot day. In the end I drank it on my birthday. Here we see the lovely little bottle, chilled to perfection in the bottom of my fridge that tends to add ice crystals. 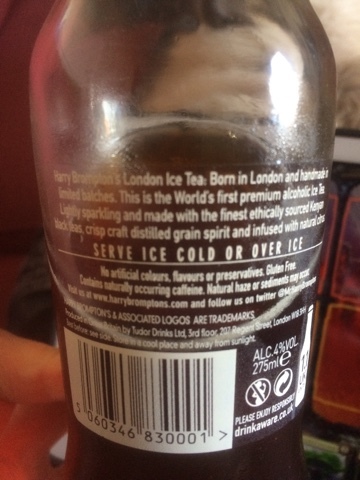 As you can just about read it's only brewed in small batches and is made with actual tea instead of colas like the cocktail 'Long Island Ice Tea' is. It's really not that alcoholic and one bottle is 1.1 units, but you can certainly taste it. The tea isn't as fab as the imported brewed iced teas, but it was good. And it was certainly a refreshing change to ciders and beers. Like a lighter premixed cocktail, it's something I'd be happy to have when out at a cafe in the summer. It's not something I'd stock up on for home use though. Overall an interesting oddity, and something to keep an eye out for in the hot days to come.